Here is another beautiful but (so far) unidentifiable isolated dorsal vertebra from the Wealden Supergroup. Rather than the usual orthogonal views (anterior, posterior, lateral) this is in an oblique view: right anterolateral. 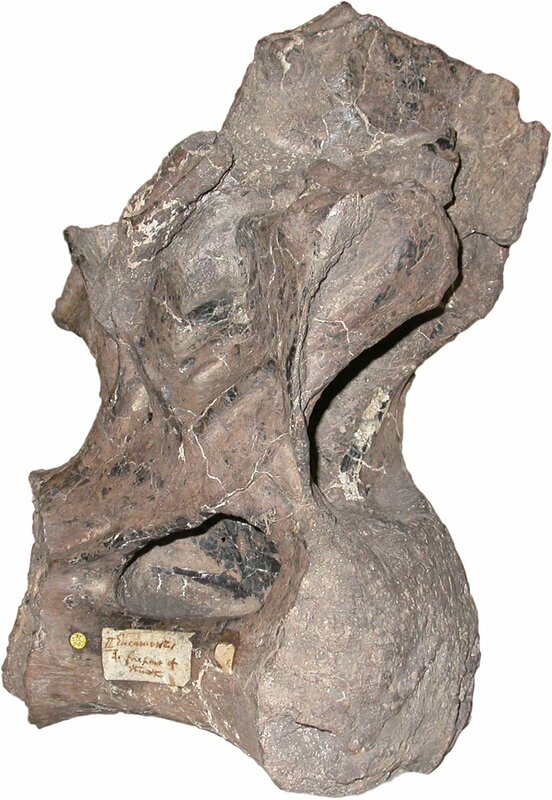 This vertebra is one of two that, together, make up the specimen BMNH R90. For my own convenience I have assigned them lower-case latters so each can be referred to individually. I call this one R90a. R90b is pretty similar, and it seems a reasonable assumption that they are from the same individual. As with the wonder that is BMNH R2523, I don’t know what R90a is yet. A preliminary cladistic analysis indicates that it is a neosauropod, probably macronarian and most likely somphospondylian, but that is based on very weak resolution and will quite likely change once I’ve added my suite of new dorsal-vertebra characters to the matrix. You’d better not identify it, otherwise I’ll have nothing to write about in my dissertation! I’ll get those C. stewarti photos from Matt, and hopefully they’ve got the other vertebrae I spoke to you about, so you can see what you’re dealing with. Ack! I gotta find those photos. Hmm. Stay tuned. I am unable to find a copy of our brief correspondence, but recall your asking for a picture or two. I am assisting my husband, who is quietly working on a super-neat sauropod project in New Mexico. I would be happy to share a few vertebral pics, but where do I send? Hi, Maria, thanks for offering to contribute. I suppose I should set up an email alias that gets forwarded to the three of us SV-POW! amigos; but for now, just send them to me on .